As Brazil comes under the World Cup spotlight, life goes on as usual for millions of Brazilians working to make a living in the shanty towns - or favelas. The largest favela in Rio de Janeiro is Rocinha, where homes are packed together in a sprawling maze of streets and alleys. Click on the faces below to explore the city within a city with six of its residents. According to the 2010 Census, about 6% of Brazil's population live in favelas or shanty-towns - around 11.25 million people across the country, roughly the population of Portugal. However, there could be even more living in these communities. Rocinha is Brazil's largest favela and unofficial estimates say it has up to 180,000, compared to the census figure of just 70,000. The expansion of the favelas - and their irregular and unregulated nature - means that these areas often lack basic services and public investment. But even among favelas there can be big social contrasts. 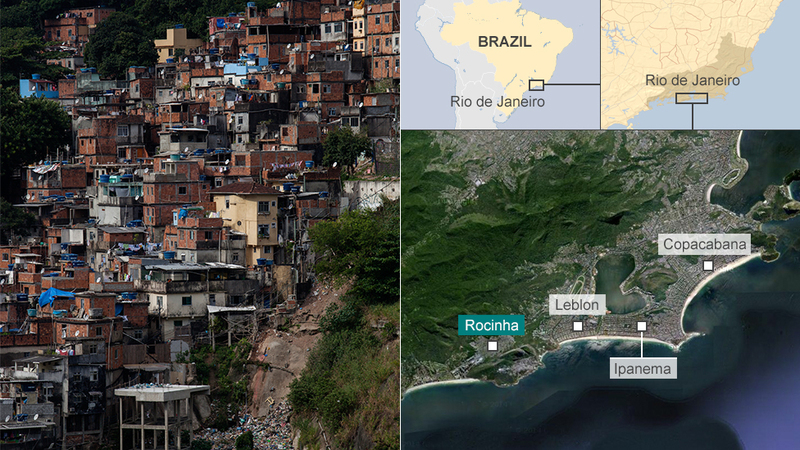 Favelas with a privileged location like Rocinha have relatively better standards than other shanty towns further away from jobs and services; and even within Rocinha there are richer and much poorer communities. The poorer areas are usually higher on the hilltop, with many houses only accessible on foot. In Rio's favelas, most homes are made from brick and cement, a majority have running water and about 99% have electricity. Sanitation is often a big problem - in Rocinha sewage flows down a large channel in the middle of houses. Recent reports suggest 65% of favela residents are a part of Brazil's new middle classes. And despite these people's relatively low incomes, many of these communities are a long way from being "slums" as they are often portrayed. 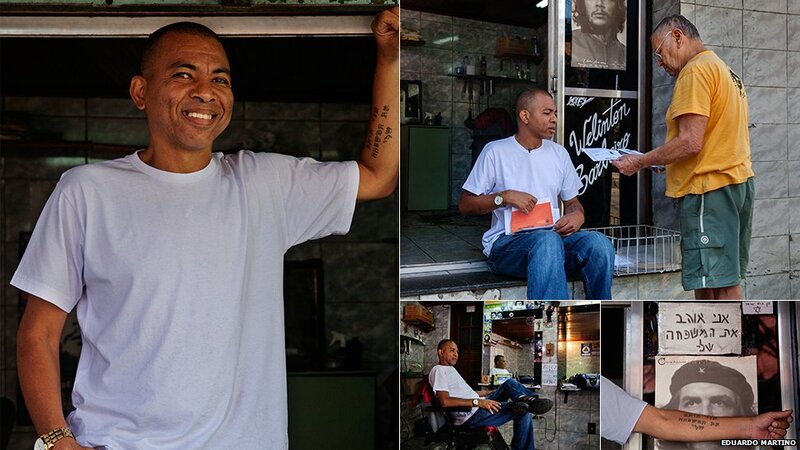 Wellington Pereira, 44, is known as Che because of all the Che Guevara posters in his barbershop. He says he has a good life thanks to his job. He managed to buy "a cosy house that has everything" - Internet, cable TV, bathroom, running water and electricity. "Rocinha is divided between people that are well off like me and people that are very poor," says Wellington. "It's embarrassing. In a country as rich as Brazil, things are just so badly managed." In addition to being a barber, he is also an unofficial postman - he takes care of one of the several mail boxes spread around in Rocinha for people to pick up their letters, since Rio's regular mail service doesn't delve deep into the favela's alleyways. Wellington says he barely knows the other side of Rio, such as Ipanema, because everything you need is in Rocinha - from banks to health centre and dentists. Carlos Antonio de Souza, 49, is a tour guide and knows Rocinha inside out. He started learning English by himself when he was 12. Today he speaks five languages - English, French, Spanish, German and Italian - and has never left Brazil. "I've never travelled the world, but I see the world every day in my place," says Carlos. He works night shifts at a hotel in Rocinha, writes poetry and works in arts and crafts. Carlos likes to take visitors deep into the favela. "I like to walk the favela from top to bottom to show people that the favela is like a city within the city." 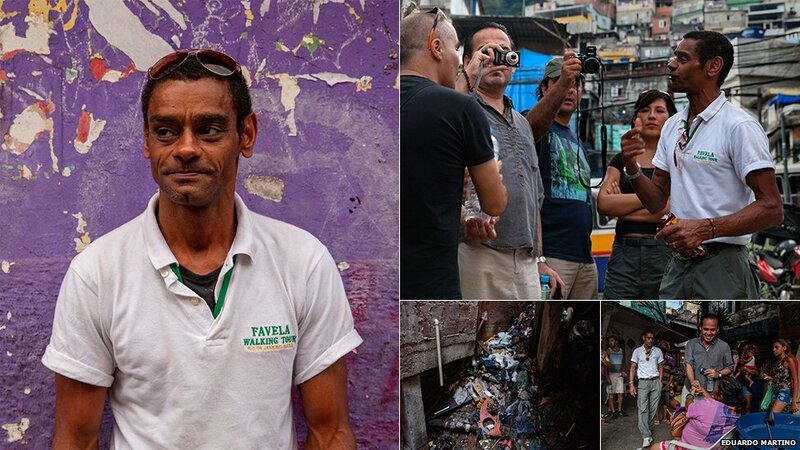 He says 99% of the visitors are foreigners as Brazilians "don't have the slightest curiosity to get to know the favela, at least once in their lives". Carlos says he likes to take visitors deep into the favela to expose its infrastructure problems and the lack of public investment. Maria das Gracas Firmino, 45, was born in Paraiba, in the Northeast of Brazil. Like thousands of people from the region, she moved to Rio de Janeiro in search of work and opportunity, in 1989. 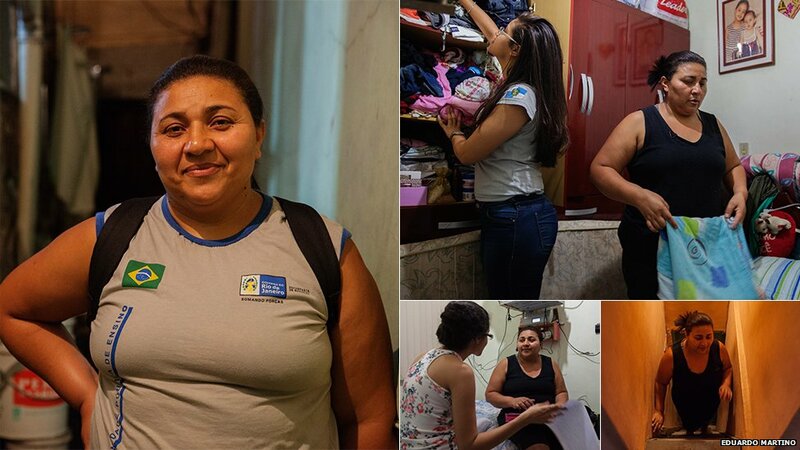 She settled in Rocinha and made a living working as a domestic maid. Today she divides her time between working as a cleaning lady and selling vegetables in a farmer's market in the upmarket neighbourhood of Leblon. Maria das Gracas never finished elementary school and is extremely proud of her daughters, two of whom have already made it into university. Now she has decided to dust off her books and go back to school. Every day she gets home after work, takes a shower and puts on her uniform to go to her evening classes. "I'm learning a bunch of new words. But sometimes I have to ask my daughters for help with my math homework." Maria das Gracas is very proud of her two daughters, who have both made it to university. In an effort to reduce crime in Rio's favelas, Brazilian authorities introduced a "pacification" programme, a policy of police occupation aimed at regaining control of the territories from drug gangs. 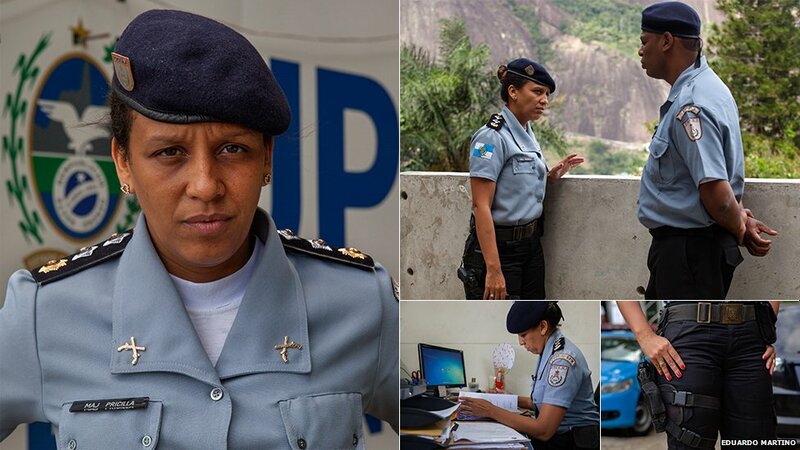 Major Pricilla Azevedo became the commander of Rocinha's local Pacifying Police Unit (UPP) last year after its officers were accused of the disappearance of a local man, shaking public confidence in the programme. Major Azevedo took on the challenging role after the state's pacification programme faced a crisis in the community. Officers of the local UPP were accused of the disappearance of Amarildo de Souza, a bricklayer who vanished after being summoned for interrogation by police - an incident that shook the residents' confidence in the programme. The pacification programme has faced serious setbacks, with recent attacks by armed groups defying some of the units. Major Azevedo was the commander of Rio's first UPP, established in December 2008 in the Santa Marta favela in Botafogo. Major Azevedo, whose unit has 670 officers, says the situation in Rocinha is much better than a year ago. She says they sometimes face resistance from criminals who don't want to lose control of their territory, but she insists that will not affect the programme as a whole. Goncala Norberto Araujo Pereira, 72, known simply as Goncalina, arrived in Rocinha from Brazil's Northeast in the 1960s. 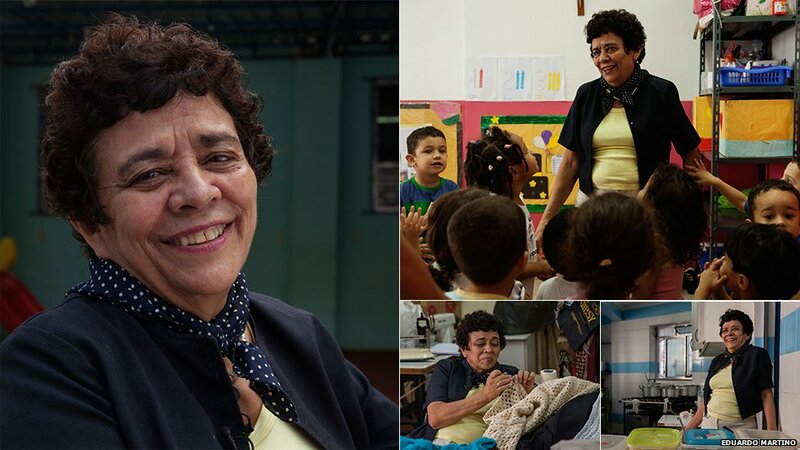 She helped set up one of the first daycare centres in the shanty town, Creche Aspa (Acao Social Padre Anchieta), and still works as a volunteer. At the age of 72 , Goncalina still works at the day care centre as a volunteer, selling second-hand items in the school shop to raise funds. She recalls the days when most of the shacks in the favela were made of thin wood and there was still place for the vegetable plantations in the favela, the "rocas", from which the community takes its name Rocinha. "When I talk to the oldest people here they say there were big plantations, cabbage, carrots, heart of palm. There's none of that anymore - Rocinha has grown and people preferred to build houses." Goncalina says she could move out of the favela, but she likes the family atmosphere of the Rocinha community. 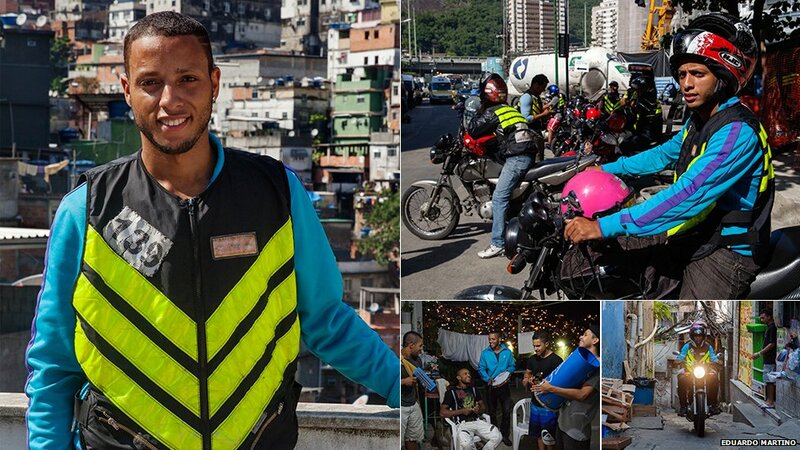 Felipe Ribas, 26 years old, has been working as a moto-taxi driver for eight years, helping people overcome Rocinha's slopes and narrow alleyways to reach their destination in the sprawling shanty-town. Felipe Ribas makes a living as a moto-taxi driver to help raise his two children. He became a father at 18 years of age and had to leave school to start working. "My mother was always concerned that I would get involved with drugs. But thank god she can be proud of me," he says. But his dream is to be a musician - he plays percussion instruments and joins his friends from the Frisson band for sessions playing pagode songs whenever he has a chance. Moto-taxi driver by day and musician by night, Felipe says life in Rocinha is hard - but there is "no victory without sacrifices". Take a two-minute tour through the streets and alleyways of Rocinha on Felipe Ribas's moto-taxi. We've speeded up the video so you can see more of the twists and turns as he weaves through the favela. Will crime crackdown transform Rio's shantytowns?